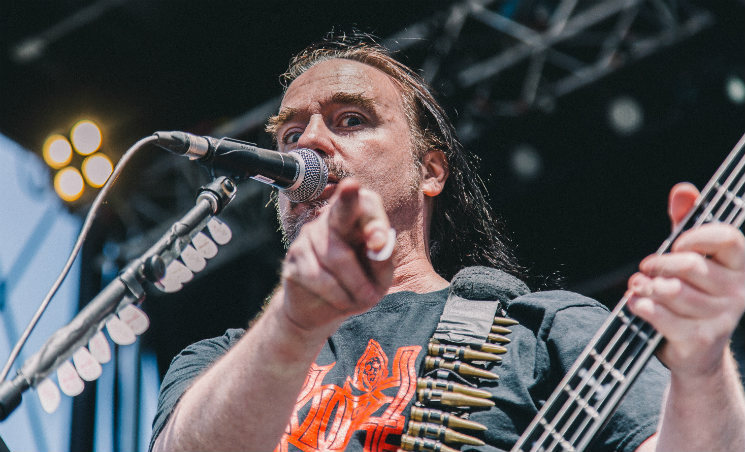 British steel surgeons Carcass came all the way to Montebello's Amnesia Rockfest, but forgot some of the tools of their trade. The melodic death metal from 2013's excellent comeback album, Surgical Steel, and its older brother, 1993's Heartwork, was present in spades. Paradoxically, the band's early, gory grindcore was, for the most part, left out of the set list for what vocalist/bassist Jeff Walker called "a bit of a punk fest." Despite getting the punk memo, Carcass treated it like a full-on metal show, with the requisite demands for pumping fists, pointed metal horns and… clapping? Okay, so that last one didn't quite fit, nor did Walker's accompanying, "If you're happy and you know it, clap your hands," but it was endearing anyway. Carcass definitely put their heart into their work, headbanging along to the bangers they played. It was a great set that could have benefitted further from a little more metal heaviness.